As the fall semester comes to a close we want to take a moment to introduce you to masters student Brian Reese. Mareesa Miles: Hello Brian! Tell us about yourself! 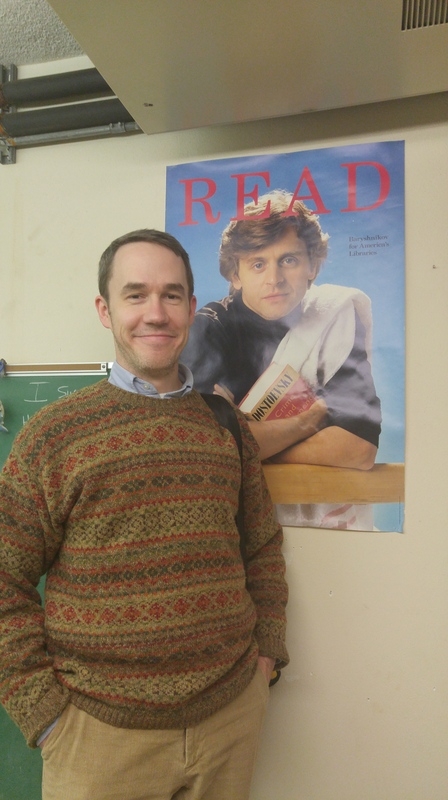 Brian Reese: I am a first-year MA student and a teaching fellow. I have strayed down many paths in my life until now. I slaved in restaurant kitchens for many years, worked as a silkscreen printer, a house painter, research assistant and data librarian, actor, musician, taught writing online . . . the list goes on. I can recite a couple thousand lines of poetry from memory. I briefly took up knitting; I made a handsome scarf. MM: Why did you choose Lehigh? BR: At the risk of being unoriginal, the English Department’s focus on social justice got me. Lehigh offers incredible support to their English MA students as well, which is rare. I also happen to have a thing for Collegiate Gothic architecture. MM: What is your favorite book outside your field of study? BR: No book is outside my field of study; I’m a goddamned superhero! Just kidding. Maledicus by Charles F. French, of course. It’s available on Amazon. MM: What are you most looking forward to this year? BR: This being my first semester as a teaching fellow and grad student with a 15/hr. week commute and a six-week-old daughter at home, I’m looking forward to making it through alive.